Since 2006, Parties to the Basel, Rotterdam and Stockholm Conventions have supported the enhancement of synergies and linkages among the three multilateral environmental agreements in specific areas where common issues arise. 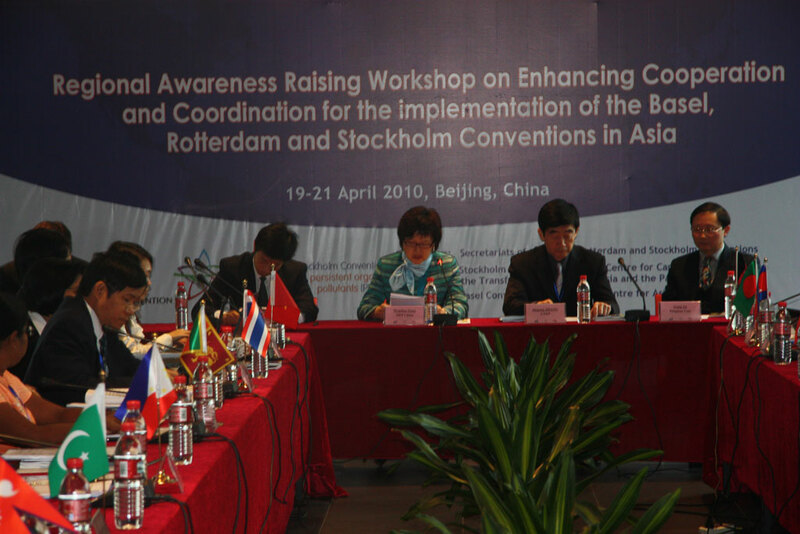 In this regard, the Conferences of the Parties to the Basel, Rotterdam and Stockholm Conventions adopted a series of decisions that led in 2008-2009 to the adoption of a set of recommendations to promote cooperation and collaboration among the three conventions at the national, regional and international level (Basel Convention decision IX/10, Rotterdam Convention decision RC-4/11, Stockholm Convention decision SC-4/34). As part of the implementation of those recommendations, the simultaneous extraordinary meetings of the Conferences of the Parties to the three Conventions (ex-COPs) was held in Bali on 22-24 February 2010 back-to-back with the 11th special session of the UNEP Governing Council. In accordance with the omnibus decision adopted at the meeting, the Secretariats are continuing their efforts to implement their joint programme to support Parties with the implementation of the synergies decisions. 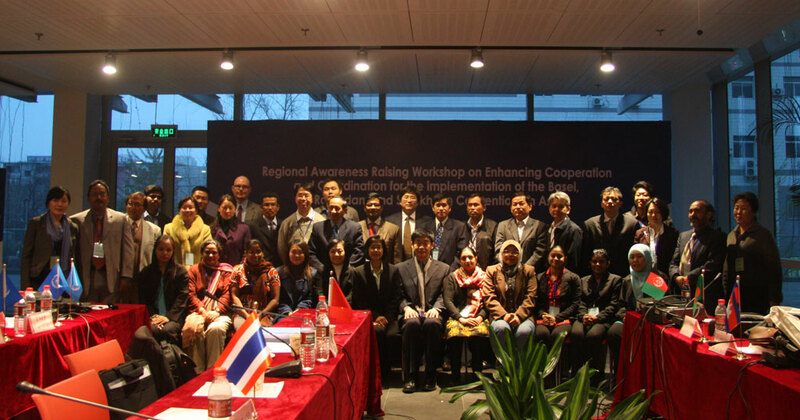 In this context, a regional awareness raising workshop on enhancing cooperation and coordination between the three Conventions was held for Asia on 19-21 April in Beijing, China in cooperation with the Stockholm Convention Regional Centre for Capacity building and Transfer of Technology for Asia and the Pacific. The workshop aimed at enhancing coordination and cooperation in the view of strengthening implementation of the three Conventions at the regional and national levels by offering a forum to Parties to share their good practices as well as to explore opportunities to further develop synergies when implementing the three Conventions. 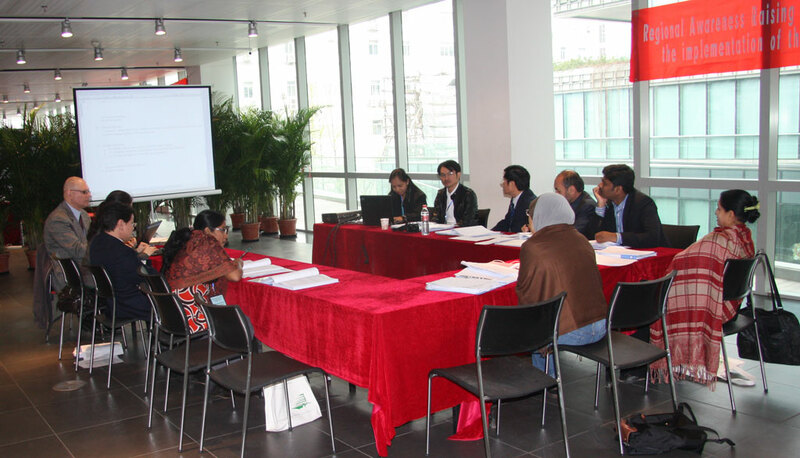 The workshop aimed at offering a holistic approach to the implementation of the three Conventions. A strong emphasis has been put on the implementation of Conventions at national and regional level in order to share good practices of coordination which facilitate joint-implementation. 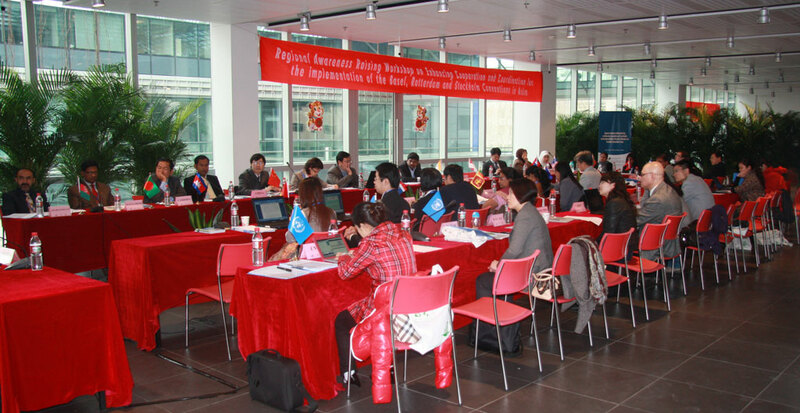 Considerations were also given to technical and financial assistance opportunities in implementing the Conventions. Increased awareness of the technical and financial opportunities to implement in a coordinated way the Basel, Rotterdam and Stockholm Conventions in the region. Official Contact Points and Focal Points from the following countries were invited to participate to the regional workshop: Afghanistan, Bangladesh, China, Cambodia, India, Indonesia, Lao’s People Democratic Republic, Mongolia, Malaysia, Maldives, Myanmar, Nepal, Pakistan, Philippines, Sri Lanka, Tajikistan, Thailand, Vietnam. 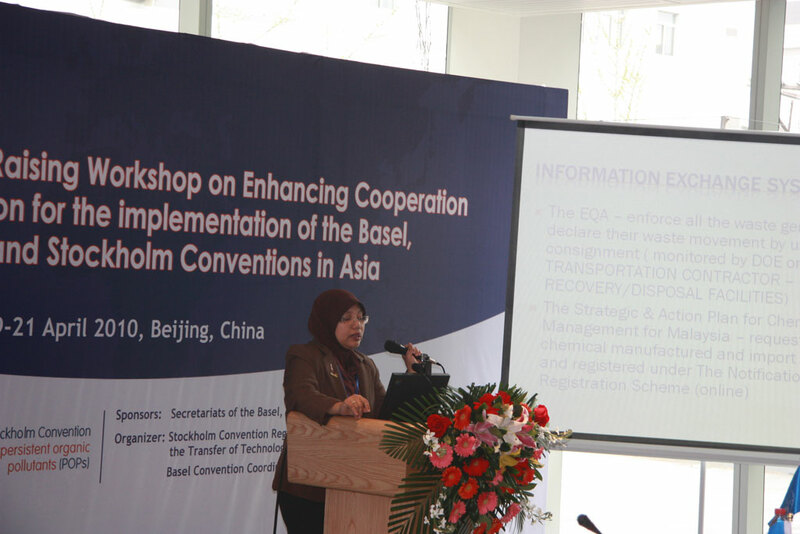 Opening of the regional workshop on enhancing cooperation and coordination for the implementation of the Basel, Rotterdam and Stockholm Conventions for Asia by Ms. Zang Wenchao, Director Depertment of Pollution Control, Ministry of Environment Protection, China; Mr. Zhang Shigang, UNEP representative; and Mr. Gang Yu, Dean, Department of Environmental Science and Engineering, Tsinghua University. 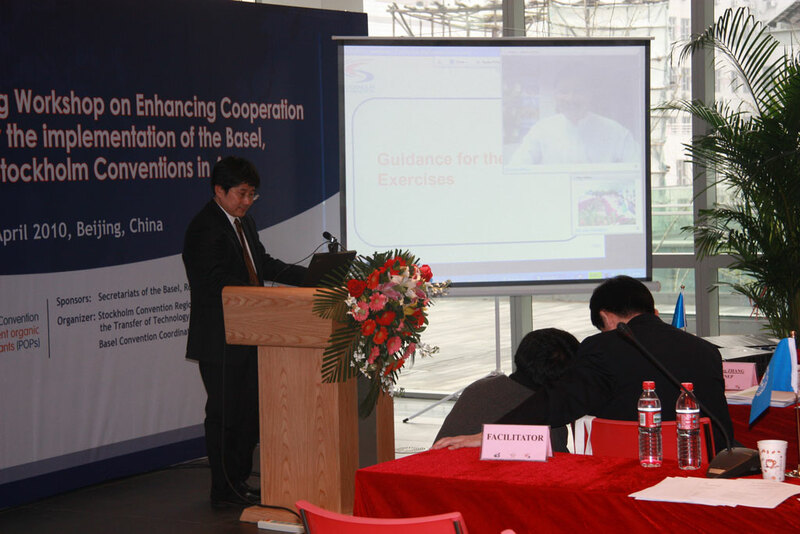 Connection with the Secretariats of the Basel, Rotterdam and Stockholm Conventions through teleconferencing. Working group discussions on how to best enhance coordination and cooperation for the implementation of the Basel, Rotterdam and Stockholm Conventions. Group picture of the workshop participants.